David and Chastina Purrington were enumerated in the 1850 Brooklyn, Green Co., WI, federal census. He was a farmer age 52, she was 51. Children in the household were Alonzo 25, Martin 23, David 22, Judson 21, Mary E. 18, Pruella 16, William 15, Amarancy 12, Orin 11, Charles 8, and Maranda 19. David and Chastina were enumerated in the 1860 Brooklyn, Green Co., WI, federal census. He was a farmer, age 62, she was 62. Children in the household were Orie 20, Charles 17, Pruella Eggleson 26, Frank Eggleson 3, and Mary Eggleson 1. Chastina was enumerated in the 1870 Brooklyn, Green Co., WI, federal census. In the household of her daughter Emerancy Mc(?) and husband. [S796] Jeff King, "Amarncy," e-mail to James H. Holcombe, 19 October 2015. Fred and Sarah P. were enumerated in the 1920 Grant, Liberty Precinct, Perkins Co., NE, federal census, ed 174. He was a farmer age 60, she was 47. Children in the household were Percy 21, Marian 19, Chas. W. 17, and Gretchen E. 13. [S182] Social Security Death Index (on-line), Ancestry.com, SSDI, Ancestry.com, SSAN 506-16-4009. Danforth M. Frayer was born on 23 September 1816; GS. He married Permilla Kimble. Danforth M. Frayer died on 18 January 1887 at age 70; GS. He was buried at Lower Cemetery, Prattsville, Greene Co., NY. Permilla Kimble was born on 23 May 1825; GS. She married Danforth M. Frayer. 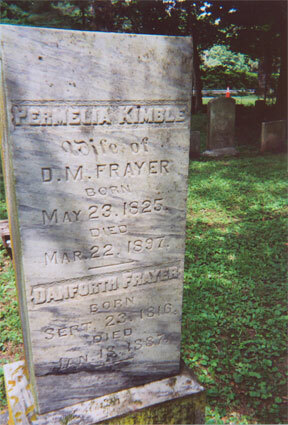 Permilla Kimble died on 22 March 1897 at age 71; GS. She was buried at Lower Cemetery, Prattsville, Greene Co., NY. [S182] Social Security Death Index (on-line), Ancestry.com, SSDI, Ancestry.com, SSAN 508-10-3196. [S182] Social Security Death Index (on-line), Ancestry.com, SSDI, Ancestry.com, SSAN 508-58-2527. [S182] Social Security Death Index (on-line), Ancestry.com, SSDI, Ancestry.com, SSAN 505-86-5232. Zeruah M. Cowdrey was born on 6 January 1835. She was the daughter of Phelps Cowdrey and Emily Holcombe. Lydia T. Cowdrey was born on 21 October 1836. She was the daughter of Phelps Cowdrey and Emily Holcombe. lineage traces back to early settler of 1630, Lynn,MA., William & Joanna (Liscence)Cowdrey. On 29 Nov.1860 she married Sidney John Thompson (or J.S. )They resided in the Boston area most of their married lives. Emily was a nurse , listed in the Chelsea,MA directory of 1872. [S807] Find A Grave, online http://www.findagrave.com, Find A Grave, database and images (https://www.findagrave.com : accessed 01 June 2018), memorial page for Emily Jane Cowdrey Thompson (9 Oct 1839–May 1885), Find A Grave Memorial no. 5612948, citing Garden Cemetery, Chelsea, Suffolk County, Massachusetts, USA ; Maintained by Andrea Brown (contributor 46490717) . Alma E. Cowdrey was born on 27 December 1843. She was the daughter of Phelps Cowdrey and Emily Holcombe. Warren A. Cowdery was born on 17 October 1788 at Wells, Rutland Co., VT. He was the son of William Cowdery Jr. and Rebecca Fuller. Warren A. Cowdery married Patience Simmonds on 22 September 1814 at Pawlet, Rutland Co., VT. Warren A. Cowdery died on 23 February 1851 at Kirtland, Lake Co., OH, at age 62. Patience Simmonds married Warren A. Cowdery, son of William Cowdery Jr. and Rebecca Fuller, on 22 September 1814 at Pawlet, Rutland Co., VT.
Rebecca Fuller married William Cowdery Jr., son of William Cowdery and Hannah Emmons, circa 1787. Child of Rebecca Fuller and William Cowdery Jr.
William Cowdery was born on 5 September 1737 at East Haddam, Middlesex Co., CT. He was the son of Nathaniel Cowdery Sr. and Mehitabel Damon. William Cowdery married Hannah Emmons on 18 September 1760 at Millington, Middlesex Co., CT. William Cowdery died in 1831 at Woodstock, Windsor Co., VT.
Hannah Emmons married William Cowdery, son of Nathaniel Cowdery Sr. and Mehitabel Damon, on 18 September 1760 at Millington, Middlesex Co., CT. Hannah Emmons died in 1769. Nathaniel Cowdery Sr. was born on 16 November 1691 at Reading, Essex Co., MA. He was the son of Samuel Cowdery and Elizabeth Parker. Nathaniel Cowdery Sr. married Mehitabel Damon on 16 September 1718 at Charlestown, Middlesex Co., MA. Nathaniel Cowdery Sr. died on 23 April 1751 at Hadley, Hampshire Co., MA, at age 59. Mehitabel Damon married Nathaniel Cowdery Sr., son of Samuel Cowdery and Elizabeth Parker, on 16 September 1718 at Charlestown, Middlesex Co., MA. Children of Mehitabel Damon and Nathaniel Cowdery Sr.
Samuel Cowdery was born on 16 May 1657 at Reading, Essex Co., MA. He was the son of Nathaniel Cowdery Sr. and Elizabeth Carter. Samuel Cowdery married Elizabeth Parker on 28 April 1685 at Reading, Essex Co., MA. Samuel Cowdery died on 17 November 1742 at Chelmsford, Middlesex Co., MA, at age 85. Elizabeth Parker married Samuel Cowdery, son of Nathaniel Cowdery Sr. and Elizabeth Carter, on 28 April 1685 at Reading, Essex Co., MA. Nathaniel Cowdery Sr. was born in 1639 at Reading, Essex Co., MA. He was the son of William Cowdery and Joanna Liscence. Nathaniel Cowdery Sr. married Elizabeth Carter on 22 November 1654 at Reading, Essex Co., MA. Nathaniel Cowdery Sr. died on 16 June 1690 at Reading, Essex Co., MA. Elizabeth Carter married Nathaniel Cowdery Sr., son of William Cowdery and Joanna Liscence, on 22 November 1654 at Reading, Essex Co., MA. Child of Elizabeth Carter and Nathaniel Cowdery Sr.
William Cowdery was born in 1602 at Weymouth, England. He died on 10 November 1687 at Reading, Essex Co., MA. Moses Cowdery Jr. was born on 21 April 1773 at Hartland, Hartford Co., CT. He was the son of Moses Cowdery Sr. and Martha Bushnell. Moses Cowdery Jr. married Lydia Baldwin in October 1805 at Hartland, Hartford Co., CT. Moses Cowdery Jr. died after 1817. Lydia Baldwin married Moses Cowdery Jr., son of Moses Cowdery Sr. and Martha Bushnell, in October 1805 at Hartland, Hartford Co., CT.
Child of Lydia Baldwin and Moses Cowdery Jr.
Moses Cowdery Sr. was born on 1 November 1731 at Reading, Essex Co., MA. He was the son of Nathaniel Cowdery Sr. and Mehitabel Damon. Moses Cowdery Sr. married Martha Bushnell circa 1755. Moses Cowdery Sr. died on 17 December 1813 at West Hartland, Hartford Co., CT, at age 82. Martha Bushnell married Moses Cowdery Sr., son of Nathaniel Cowdery Sr. and Mehitabel Damon, circa 1755. Child of Martha Bushnell and Moses Cowdery Sr.